Green Drinks Baltimore is Back! Features include organic Vodka manufacturer Sloop Betty and information on green building and homes! Suggested donation is a sliding scale of $5-15. The second “Who Wants to be an Urban Farmer” is a morning of workshops that provide the opportunity to learn specific production techniques utilized at urban farms in Baltimore, Maryland. Each workshop will present a different specialized tool to growing food for production in Baltimore City. The workshops will be focused on urban farming and production, and presented in a scope and scale able to be transferred to backyards and open urban green space. The best recipients of the workshops will be new urban farmers, and home and community gardeners looking to improve their operations with efficiency, diversification, and output. Join Downtown Partnership of Baltimore for “Cycle Plaza,” a bicycle block party, next Wed, April 25th, 5-7pm at Center Plaza. Race Pace Bicycles will provide free bike check-ups. There will be free snacks and giveaways and tons of info on city biking. Get a preview of the new Baltimore Bike Map before its release on Bike to Work Day. 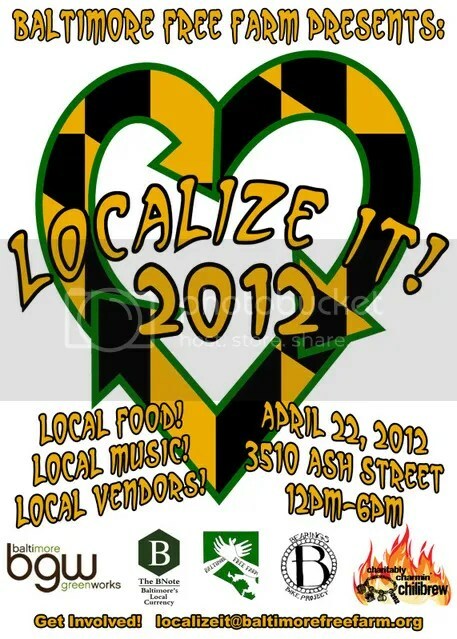 On Saturday, April 21th celebrate the 9th Annual Baltimore EcoFest. From Noon-5 p.m. residents, businesses and organizations supporting a greener Baltimore, will gather in Druid Hill Park as we gear up for Earth Day. EcoFest is an outdoor festival with music, food and activities and over 100 vendors who will show you how Baltimore is working to become a more sustainable city. Attendees have the opportunity to meet local growers, take a bike tour, learn about new green energy technologies, participate in outdoor yoga, network with the “green-minded” of Baltimore and more! For an EcoFest schedule and Baltimore Green Week events, CLICK HERE. Justin Martin talks about his new book, Genius of Place: The Life of Frederick Law Olmsted. Tuesday, Apr 17, 2012, 7:00 p.m.
Best remembered for his landscape architecture, from New York’s Central Park to Boston’s Emerald Necklace to Stanford University’s campus, Olmsted was also a Civil War hero, fervent abolitionist, crusading journalist, and an early voice for the environment. Most of all, he was a social reformer. He didn’t simply create places that were beautiful in the abstract. An awesome and timeless intent stands behind Olmsted’s designs, allowing his work to survive to the present day. Justin Martin is a former staff writer for Fortune magazine and the author of Greenspan: The Man Behind Money and Nader: Crusader, Spoiler, Icon.